For three days, Danish Ali Bhat kept frantically trying for a security pass that would allow him and his family to travel on the Srinagar-Jammu National Highway on his wedding day, Sunday. On Saturday morning, the family finally got a travel pass, but by then Bhat and his wedding procession had already left for his bride’s village in Doda. The permission, signed by the Additional District Magistrate, Anantnag, said Bhat be allowed to move with 12 persons in four vehicles on Sunday, to return the next day. It specified the numberplates of the vehicles, said “the permission is valid for 02 days only”, “subject to the Srinagar-Jammu NHW road clearance”, and “after frisking/security check”. Bhat’s brother Zameer Ali said the wedding party left a day earlier as “we didn’t want to take any chance”. All along the highway, on the eve of the first day of curbs on movement of civilian traffic coming into force, there is similar uncertainty. While the authorities said Friday they would allow schoolchildren, government employees and emergency services to use the highway after taking permission, there is no clarity on how this would be enforced. 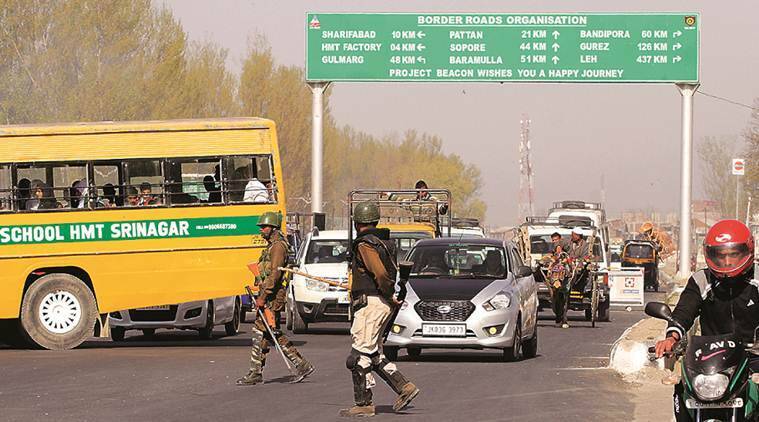 To facilitate the movement of security convoys for the parliamentary polls starting April 11, the government has banned civilian traffic twice a week (from 4 am to 5 pm on Sunday and Wednesday) on a 270-km stretch of the highway from Udhampur in Jammu to Baramulla in Kashmir. The order will remain in force till May 31. On Saturday, a list of magistrates who will be manning the highway junctions was released, with travellers told to contact them in case of emergencies. The wedding of Bhat, 30, a resident of Qazibagh in South Kashmir’s Anantnag, was fixed two months ago. The bride lives in Doda district in Jammu region. The family has decided to return to the Valley with the bride on Sunday evening. “They will leave Doda after the restrictions on movement are over,” Ali said. Down the highway from Srinagar to Baramulla and Srinagar to Qazigund, the road is crawling with security personnel on patrol, with Army vehicles stationed at strategic points. No civilian vehicle is allowed to stop or even slow down. However, with an estimated 10,000 vehicles using the northern and southern stretch of the highway each every hour, people expect major inconvenience. In the decades since the highway has existed, this is the first time such curbs have been imposed. At Kandizaal village in South Kashmir, Sadaf Fayaz, a student of Class 6, is worried about how she would get to her Srinagar International School at Patalbagh. Two weeks ago, late in the night, the authorities had dug up a road connecting the village to the National Highway — like several other roads, as part of steps taken after the attack on the CRPF convoy in Pulwama on the highway. As of now, over a dozen colleges and many government and private schools are looking at the prospect of staying shut on the highway ban days. These include top private schools such as Saint Joseph Public School, Baramulla Public School, DPS Baramulla and R P School HMT Srinagar, which fall along the highway. “This is definitely a problem and we are approaching authorities to clarify what can we do,” says Shabir Ahmad Khan, Principal of R P School, which is located on the Srinagar-Baramulla stretch of the highway at Zainakote. At least nine hospitals also lie along the road, including key government hospitals such as SKIMS Medical College and Hospital in Srinagar. Near the saffron fields of Galander, in South Kashmir’s Pampore, as a group of tourists got off vehicles to take pictures, security personnel rushed over and forced them to leave. “This is why the people of Kashmir are against us,” a tourist shouted before driving away. Trade bodies are worried over the ban hitting business. “Access to Kashmir is limited. We do not have a rail link (the Udhampur-Bahinal stretch is still under construction), or any means of water transport. Air travel, due to the policies of the Civil Aviation Ministry, is out of bounds because of high fares… The closure of the only available road link will have disastrous consequences for the economy,” said Farooq Amin, general secretary of the Kashmir Chamber of Commerce and Industries.